An oil spill in your driveway or garage is unsightly, messy, and can even be dangerous. It may happen when you’re changing your vehicle’s oil, or if it leaks oil or maybe you accidentally knocked over an oil canister. No matter HOW the spill occurs, promptly cleaning it up will help reduce the possibility of a permanent stain. An oil spill that’s left on concrete will actually begin to break and weaken the concrete itself. Cleaning up the oil stain lowers the risk that you, a child or a pet might walk thru the substance and track it into your house. Removing the oil will also remove the chance of injury. Fortunately, there are a couple good options for cleaning up the mess. When an oil spill occurs, your first reaction may be to get the hose and start rinsing the oil away. Unfortunately, oil and water do not mix so you will be unable to even dilute the oil. Instead the water will simply push it to other areas of the concrete or into your yard. To successfully clean up an oil spill you must absorb the oil. One of the cheapest and most effective ways to absorb the oil is to spread simple, inexpensive clay kitty litter across the surface of the oil spill. Over the course of a day, the kitty litter will absorb the excessive oil. Now simply get your push broom and sweep up the litter and dispose of it. You will still see a discoloration or stain on your concrete once the oil is soaked up, but at now you can address the stain itself without having to worry about spreading the oil everywhere. Sawdust can also be used in place of kitty litter. Once absorbed, the next step is removing the oil stains from your driveway or floor. Warning: Be careful of companies who sell so-called “premium oil absorbents” (such as Oil-Dri). Many of these are essentially kitty litter with deodorants added but they sell for 10x the price. CHEAP OPTION: Probably the cheapest way to clean up an oil stain is to mix a few squirts of basic dish soup in hot water. Create a hot, soapy mixture. Now take a brush and dip the brush into the water and soap mixture. Use the brush to work the substance across the stain’s surface. 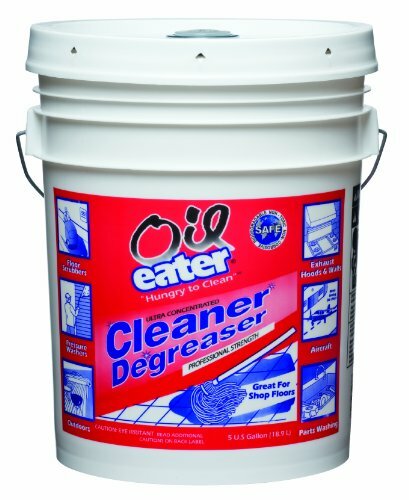 BEST OPTION: Dish soap does an okay job but I found that the absolute best way to clean up oil stains is by using a product called Oil Eater. I’ve been buying this stuff for the past few years and it works amazingly well even on old oil stains. It also works great as a parts cleaner and general degreaser. My wife even uses it in the laundry to get out grease stains from my work clothes. I tend to buy the 5-gallon bucket size since it’s by far the best deal but it also comes in a gallon size. Spilling oil in our garage or driveway is never pleasant but with quick clean up, the damage doesn’t need to be permanent. It’s always a good idea to keep kitty litter on hand any time you work with or around oil. If your car leaks frequently, you might want to consider an inexpensive garage oil mat such as this one or even a full size garage mat. Alternatively, a good old large piece of cardboard underneath your vehicle will absorb most minor spills before they hit the concrete. For best results, you may want to use some type of garage parking aid (even a hanging tennis ball) to make sure the car is in the right spot for the cardboard to do its job. What is the best way to dispose of the oily kitty litter/sand or whatever was used to soak up the spill? 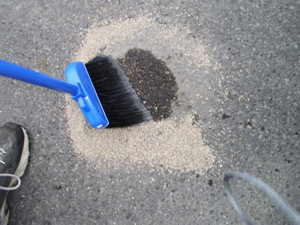 Unless you are cleaning up gallons of oil, disposing the oil soaked kitty litter in your regular trash is normally acceptable for typical small spills. You could also go the extra step of putting the material in a sealable, leak-proof container. If you want to be completely sure, check with your local regulations since it varies by area. It is sometimes easy to go with the easiest choice, but it will always pay off to go with something that has been tested and proven. Oil Eater actually worked pretty well. There’s still a oh so slight color difference between the new concrete and where the oil was but nothing I’ve found so far works better. Can I use Oil Eater to clean my engine? I have a lot left over and am thinking it would work as a degreaser. I actually had this same question a while ago myself. YES, you can use it to clean oil or grease off an engine. Make sure you cover up any electronics or anywhere else you don’t want liquid to go. Spray it on a COOLED engine and let it sit a few minutes. Then rinse of with a hose or ideally a pressure washer. I allowed someone to use my carport not knowing he had an oil leak.. I rent this property and have used a degreaser on it as well as power washed, but the stains are still there. Are there professional people who can do this without the expense. A degreaser such as Oil Eater plus some scrubbing with a wire brush (important) is still your best bet. Cleaning alone is not going to 100% remove the stain, but over time it will naturally fade away. Some power washing companies do have a technique for oil stain removal using commercial cleaners but it won’t be cheap. You’ll have to call around locally to see who offers this service. I would like to tell you there is now a product that is 100% organic, sustainable and pound for pound the least costly hydrocarbon absorbent in the world. Just 12 pounds of this product will absorb over 6 gallons of oil. We developed the processing procedure of this product right here in the U.S. This product floats on water while absorbing hydrocarbons in seconds. It has been approved by the State of California and your own Polk County landfill to go directly into the landfill after use. Because it hold the hydrocarbons for 18 to 20 years, there is never a possibility of the hydrocarbons leeching into the soils or ground water. When it comes to fracking, this product can and will absorbent any and all of hydrocarbons in just seconds. We have developed this product to not only cleanup hydrocarbons spills but we desperately want to try it on farming operations in Florida to stop the excess nitrogen and phosphorus from leaching off the farmers fields into your tributary systems. According to your government analysis, these 2 products and sunshine are the primary cause of the algea blooms you experience every year. This product absorbs both nitrogen and phosphorus.